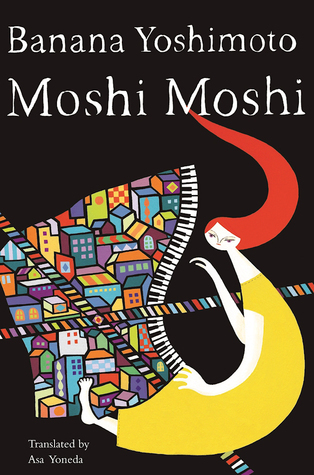 Moshi Moshi / Banana Yoshimoto; translated from the Japanese by Asa Yoneda. I was really excited to get my hands on this Yoshimoto book; her book Kitchen was one of my favourite discoveries ever, and I've really enjoyed her work for a long time. Moshi Moshi was even better than I'd hoped. While the plot is fairly straightforward, the execution was dreamy and satisfying. Yoshie is a young woman whose father dies in a bizarre murder suicide pact with a strange woman he was distantly related to. She and her mother are dealing with the aftermath of this traumatic event, and Yoshie decides it's time to become more independent. So she moves to the Tokyo neighourhood of Shimokitazawa. In fact, the Japanese title of this book is Moshi Moshi Shimokitazawa, since the neighbourhood itself is such an important element of the book. When I came across this lengthy section of the book about the value of individual lives and the power of place, I was really struck by it, reading it over a few times. I feel like it is the heart of the book. Since it's too long to copy out, I took a quick photo to share with you. The setting is so strong and meaningful in this story; in the afterword, Yoshimoto talks about how this real neighbourhood is changing, how chain stores are moving in and changing the slow, out of the common round kind of feeling it once had. How it offered a place for people who wanted to live at a different pace, and that this loss is an important thing to notice. Her statement is melancholy but not hopeless. But the story itself also includes wonderful characterizations of both Yoshie and her mother. Through their tragic event, "Mom" rediscovers her earlier, younger self, gets a job and leaves off being a wealthy housewife. It's a powerful image of middle age that resonated with me, even though I've never lived a wealthy housewife lifestyle! Through Yoshie's attempts to find her role in her own life, and Mom's reinvention, and the setting itself, the questions of authenticity and belonging echo through the narrative. Yoshie has a job in a tiny restaurant across from her new Shimokitazawa apartment, and even that changes -- impermanence is also a theme -- when the owner decides to close after their building is purchased by a large company. But the possibility of a new direction appears at the same time, when Yoshie is invited to study food in France. So there are ups and downs, changes, melancholy, beauty, relationships, spirits/ghosts/dreams, food, and more to enjoy in this quiet, leisurely told book. I found it a little slow at the start but once I slowed myself down to the pace of the story, I really, really liked it. But I was taken with this story; it was thoughtful, evocative of a specific time and place, and had a lot of internal dialogue going on -- all things I like. Yoshimoto's afterword was almost as interesting as the story itself, and the book is a lovely thing, with black & white prints interspersed here and there. Thank goodness for interlibrary loan, once again! I love that passage you included. Gives you a lot to think about.